Every excuse you have for not exercising -- money, knowledge, equipment, time -- can pretty much be eradicated with equipment-free exercises. You don't have to carry a set of dumbbells with you or make the time to head to the gym. You don't have to invest money in equipment or hire a trainer. You literally just need your own body and enough space to move around. And now, you don't have to wonder how the hell to work your biceps or upper back without dumbbells or a pull-up bar. Here's your solution for targeting every body part without equipment. You're welcome. Sitting All Day Kills Your Back. These Exercises Will Help. Using your own body weight you can target each calf individually with a standing single-leg calf raise. Simply stand next to a wall or sturdy chair, placing one hand on the sturdy object for support. Bend your knees slightly and lift your right foot from the ground, shifting your weight to the ball of your left foot. Contract your left calf and lift your left heel from the ground, rising up as high as you can on the ball of your left foot. Slowly lower your heel back toward the floor, stopping just before it touches down. Continue performing calf raises (about 20-30 reps) before switching sides. 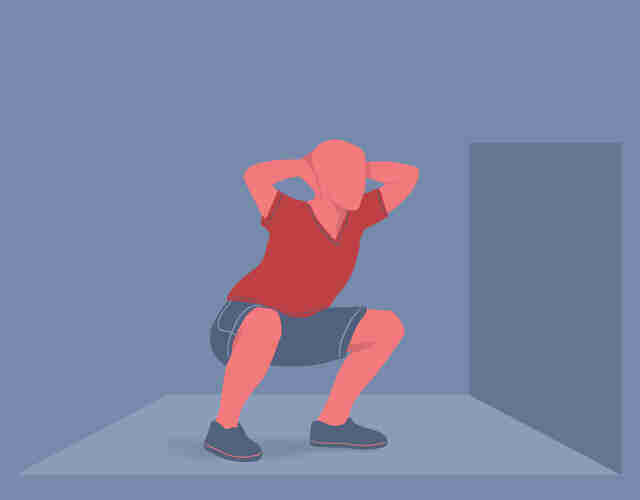 Any properly performed bodyweight squat is going to be your best bet for equipment-free quadriceps engagement, but if I have to choose just one, it's going to be the prisoner squat. This is because in addition to targeting the entire lower body, the arm placement also fires up the shoulders, upper back, and core in ways a basic bodyweight squat does not. Stand with your feet shoulder-width apart, your weight centered in your heels. Bend your knees slightly, tighten your core, and place your hands lightly behind your head, your elbows pointing outward. You'll keep your arms in this position throughout the exercise, just make sure you don't push or pull on your head or neck. 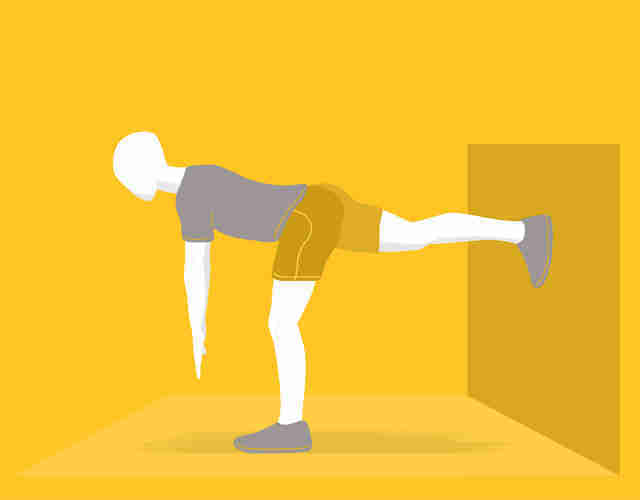 From this position perform a traditional bodyweight squat by pressing your hips back and bending your knees to lower your glutes toward the ground. Keep your chest upright throughout the exercise. When you've squatted as low as you comfortably can with good form, press through your heels and return to standing. Perform 12 to 15 repetitions. Deadlifts offer a killer hamstring workout, but they're hard to perform without dumbbells or a barbell. The single-leg deadlift unilaterally targets each hamstring while using your bodyweight as resistance. Focus on using your working hamstring to control your movements, not your low back. Stand with your feet hip-distance apart, your knees slightly bent. Shift your weight to your left foot, keeping your weight in your heel. Lift your right foot from the ground and extend it behind you, your toes touching the ground lightly. Tighten your core, and keeping your torso completely straight from your hips to your head, press your hips backward as you tilt your torso forward toward the floor, using your left hamstring to control and support the action. You can leave your right toes on the ground for balance, or to make the exercise harder, allow your right foot to lift from the ground, extending behind you as your torso tilts forward. The goal is to get your torso to a parallel position with the ground, but if your hamstrings are tight, only lower as far as you comfortably can. From the lowest point, tighten your left hamstring and glute and use it to "pull" your torso back to the starting position. Perform 10 to 15 repetitions before switching sides. 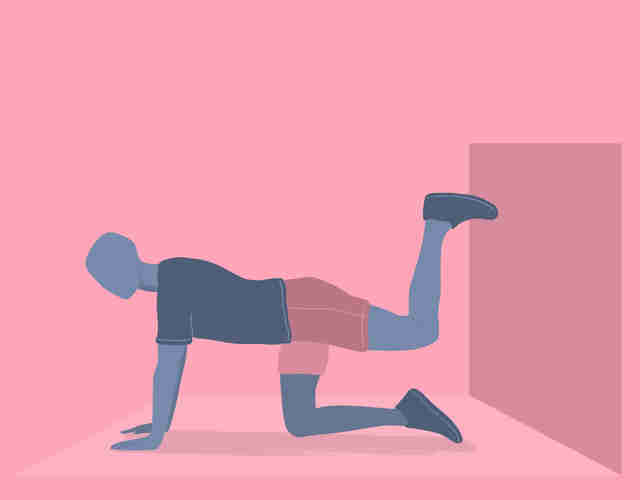 Also known as "donkey kicks," the quadruped hip extension may look like an awkward movement, but in a 2006 study by the American Council on Exercise, quadruped hip extensions were more effective at isolating and engaging the gluteals than any other exercise, including squats and lunges. Start on your hands and knees on the ground, your knees below your hips, your palms below your shoulders. Flex your feet so you have a 90-degree angle at your hips, knees, and ankles. Tighten your core and shift your weight to your right side. Maintaining the 90-degree angle at your ankle and knee, extend your left hip, lifting your leg upward and behind you until your body forms a straight line from your left knee to your head. Reverse the movement and lower your knee back toward the floor, stopping just before it touches down. Perform 12 to 15 repetitions before switching sides. Alternating side lunges are an excellent way to target your inner thighs (your adductors) while simultaneously challenging all the major muscles of your lower body. The alternating motion even adds a power element to the exercise as you must forcefully press back to standing. Stand with your feet hip-distance apart, your hands on your hips, your knees slightly bent. Take a wide step to the right with your right foot, keeping your left leg straight. 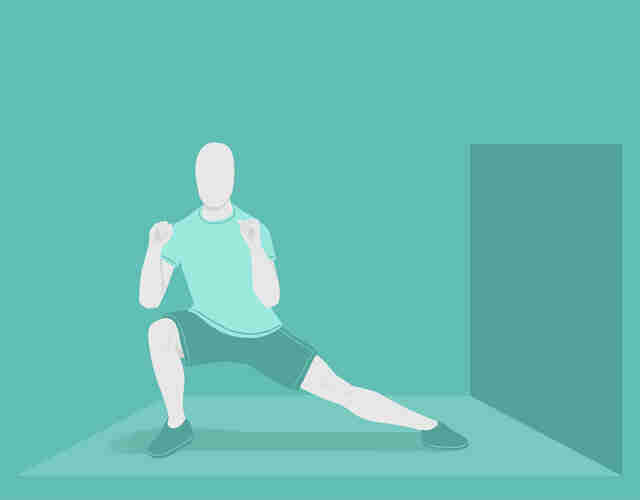 When you plant your right foot (keeping your weight in your heels), bend your right knee and press your hips backward to lower into a side lunge. Make sure you keep your core tight and your knee behind your toes as you lunge. From the bent-knee position, press forcefully through your right heel and return to standing using your adductors to draw your right leg back to its starting position. Repeat to the opposite side. Perform a total of 10 to 12 reps per side. 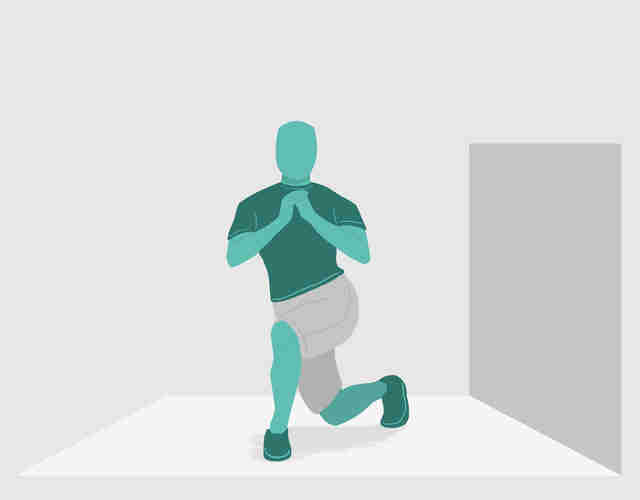 Like the side lunge, the alternating curtsy lunge is an excellent way hit the abductor muscles (specifically the gluteus medius and minimus) while targeting your entire lower half. Stand with your feet hip-distance apart, knees slightly bent, with your hands on your hips. Shift your weight to your left foot, keeping your weight in your heel. Step your right foot diagonally behind your left leg, placing the ball of your right foot on the ground, as if about to perform a curtsy. Keeping your torso upright and tall, bend both knees, lowering your right knee toward the floor while making sure your left knee tracks with your left toes, your weight still in your heel. Just before your right knee touches the ground, press through your left heel and step your right foot back to the starting position. Repeat to the opposite side. Perform 10 to 15 repetitions per leg. 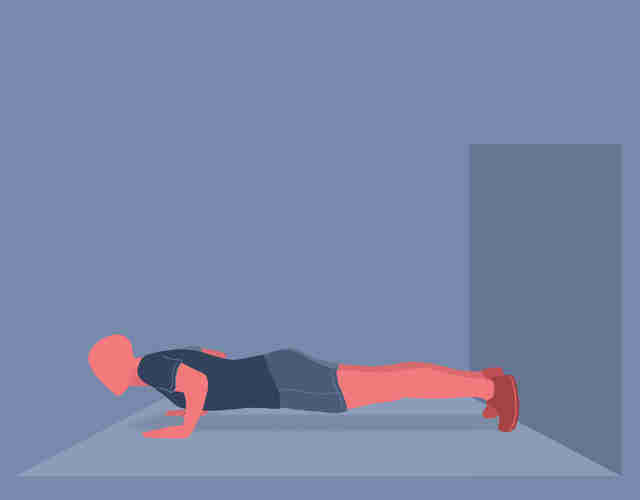 When it comes to targeting all the major muscles of your core, including your rectus abdominus, transverse abdominus, and even your obliques, you can't beat the basic plank. Start on all fours, your forearms on the ground so your shoulders are over your elbows, your hips over your knees. Tighten your core from your shoulders to your hips and step your feet behind you into a plank position. Make sure your body forms a straight line from your heels to your head, and really focus on contracting your abs and hips for support. Hold the position for 30 to 90 seconds, stopping when you can no longer maintain proper form. While the plank certainly engages the obliques, to really target these muscles that wrap around your torso, you need to perform exercises that involve twisting or bending. The oblique twist is a favorite because it requires core stabilization combined with a twist; plus, you can do it with or without added weight. Sit on the floor, your knees bent, your heels on the ground. Keep your upper arms close to your sides, but bend your elbows to a 90-degree angle. Tighten your core and lean back so your body forms a "V" with your torso and thighs. 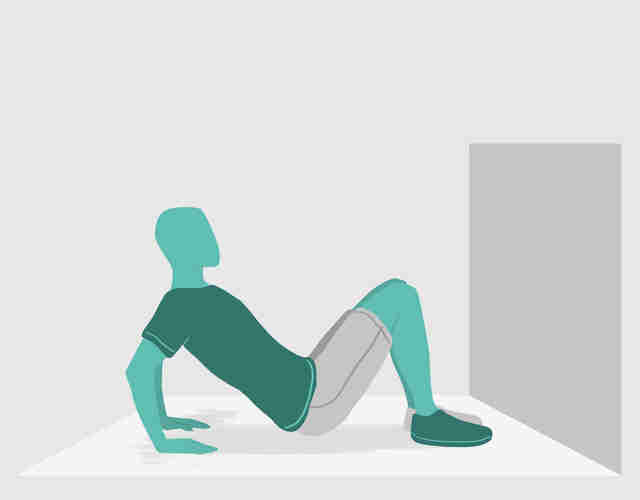 Keeping your torso fixed in space at this angle, and your glutes fixed to the floor, twist your body as far as you can to the right, reaching your hands toward the ground on your right side. When you've twisted as far as you comfortably can, reverse the movement and twist back to center, continuing the twist to the left side. Continue the twisting motion, performing 15 to 25 twists to both sides. Bird-dog extensions are an excellent way to strengthen the posterior chain, particularly the stabilizing muscles of the erector spinae, without placing undue strain on the lower back. Start on your hands and knees on the floor -- your knees under your hips, your palms under your shoulders. In a single, fluid motion, extend your left arm up and directly in front of your shoulder, pointing forward, while you simultaneously lift and extend your right leg behind you, pointing your toes backward. 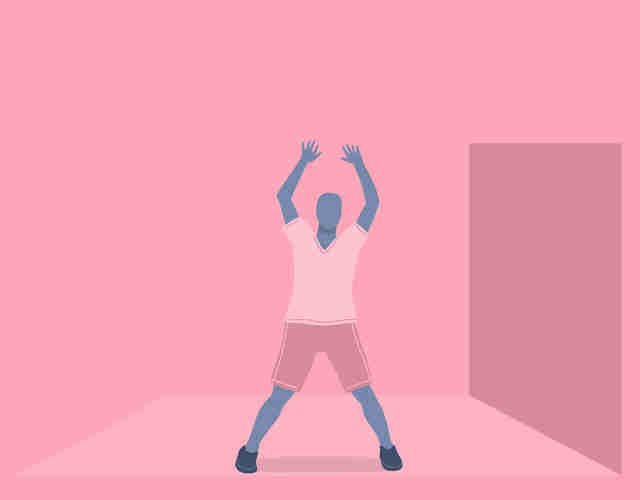 When you're forming a straight line from your extended leg to your extended arm, hold for a second, then reverse the movement, returning your palm and knee to the ground. Perform 15 to 20 repetitions before switching sides. If you have access to a pull-up bar, pull-ups are always going to be your best bet for a bodyweight exercise that targets your upper back. And yet, a pull-up bar is technically equipment, so I'm not going to assume you have access to one. Which actually makes it really hard to find solid exercises that target the large muscle groups of the upper back. Hard, but not impossible. The Superman lat pulls exercise is typically performed with a resistance band to provide extra resistance, but even without a band it's a challenging exercise because you're forced to work against gravity as you perform the movements. Lie on your stomach on a mat, your arms extended in front of you, your legs fully extended behind you. Tighten your core and use your abs, low back, and glutes to lift your chest, shoulders, and arms off the ground. From this position, tighten the muscles of your shoulders and upper back and squeeze your shoulder blades together as you bend your elbows outward, drawing your hands toward your shoulders. The trick is to really focus on squeezing your shoulder blades together. When your hands are just in front of your shoulders, reverse the movement, extending your arms in front of you. Further engage your upper back and shoulders by consciously working against gravity as you aim to keep your hands in a single plane -- don't allow them to drop closer to the floor. Perform 15 to 25 repetitions. No surprises here, the basic push-up is about as good as it gets when it comes to equipment-free chest exercises. Start in a push-up position, your palms under your shoulders, but just wider than shoulder-width apart. Extend your legs fully so your body forms a straight line from heels to head. Tighten your core and bend your elbows, lowering your chest toward the ground. When you're just shy of touching down, reverse the movement and return to the high push-up position. Perform 10 to 12 repetitions. 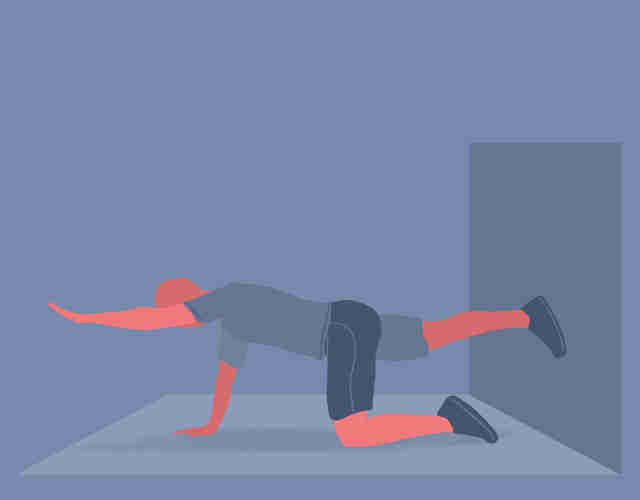 If full push-ups are too challenging, lower your knees to the ground for a modified version. Shoulders are another challenging muscle group to isolate without equipment. Granted, they're put to work in conjunction with many other compound exercises, but if you want to target the shoulders alone, your best bet is a pike shoulder press, also known as a pike push-up. 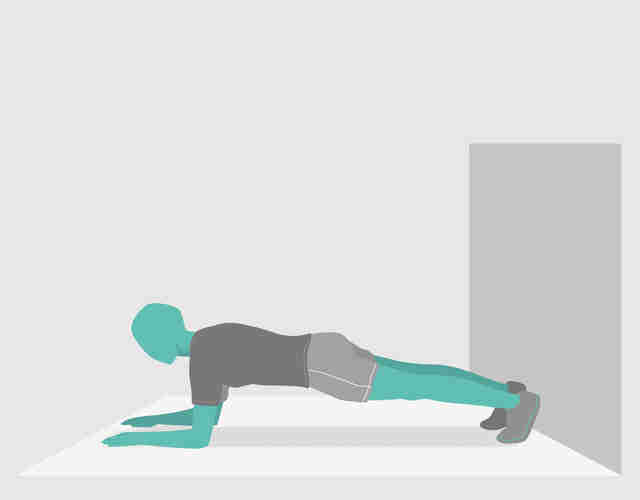 Start in a high push-up position: your shoulders over your palms, your legs fully extended. 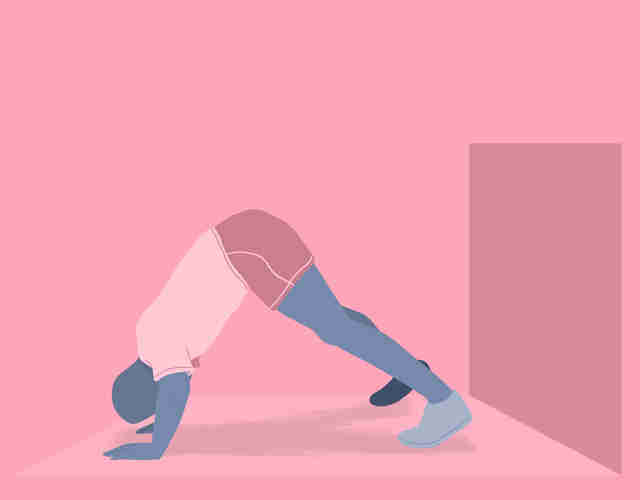 From here, press your hips straight up toward the ceiling, entering a downward dog position that looks like an inverted "V." If you can, walk your feet forward a few inches to further extend your torso so your arms and shoulders are directly over your palms. From this position, bend your elbows outward, lowering your head toward the ground. Just before it touches down, reverse the movement and press through your palms to extend your elbows. Perform 10 to 15 repetitions. 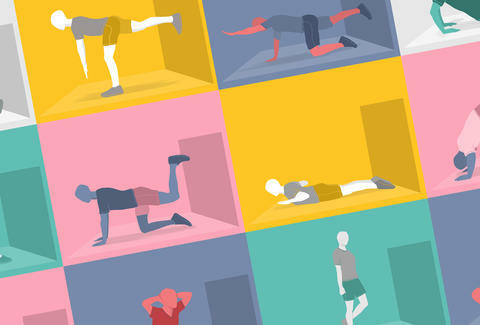 The Only Equipment for This Full-Body Workout? The Beach. For this unusual biceps curl, you're responsible for providing your own resistance. 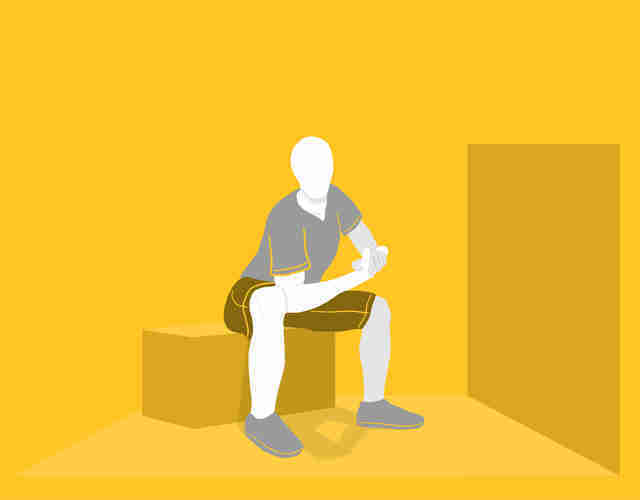 Sit on a sturdy object (any chair, bench, or large rock will do), your feet planted on the ground slightly wider than shoulder-width apart. Lean forward and place your right elbow against the inside of your right thigh, just above your knee, allowing your forearm to hang straight down. Press your elbow into your thigh throughout the exercise, fixing your arm in place. Bend your right elbow slightly, bringing your right palm upward so you can clasp your right hand with your left. Your left hand and arm are responsible for providing resistance during the curl. Tighten your right biceps and begin bending your elbow to draw your right palm to your right shoulder, but as you do so, press downward through your left hand to resist the curl, making it harder. When your right hand reaches your right shoulder, reverse the movement, continuing to press down through your left palm as you use your right biceps to control the downward phase. Perform this exercise slowly to maximize resistance in both directions. Perform 10 to 15 repetitions before switching sides. Floor dips are a simple and effective way to fire up your triceps, but they do limit range of motion, so if you have access to a sturdy chair, I'd opt for chair dips instead. Sit on the ground, your knees bent, your heels planted. Place your palms flat on the ground behind your hips, your fingers pointing forward. Tighten your core and lean back so your body forms a "V" with your torso and knees. Press through your heels and palms and lift your hips off the ground, extending your elbows fully. You may want to adjust your palm position so your palms are aligned under your shoulders. From this position, bend your elbows straight back, lowering your glutes toward the ground. Just before they touch down, reverse the movement and press through your palms to extend your elbows. Perform 10 to 15 repetitions. You don't want to forget your heart and lungs when it comes to a full-body workout. 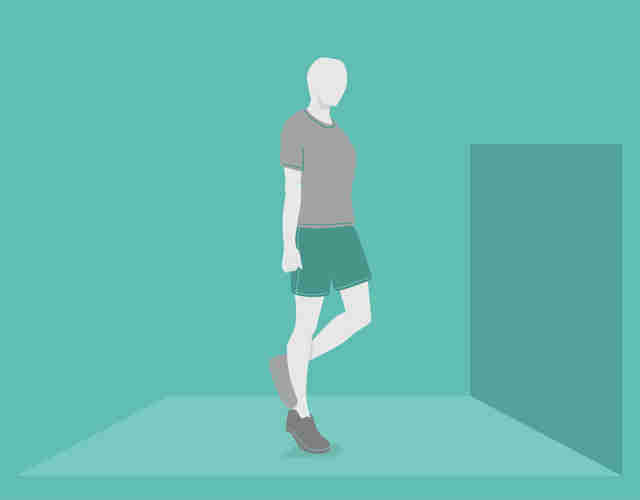 There are lots of equipment-free cardio exercises that can do the trick -- walking and running immediately come to mind -- but if you're looking for an effective exercise you can do anywhere, nothing beats the basic jumping jack. Stand with your feet together, your arms at your sides. In a single motion, hop your legs out laterally as you swing your arms up over your head. Immediately hop your feet back to center as you swing your arms back down to your sides. Continue as fast as you can for 30 to 60 seconds. Rest for 10 to 20 seconds, then continue the work-rest intervals for a minimum of 10 minutes. If the lateral hop is too challenging for your joints, step out the exercise instead, stepping your right leg out laterally as you swing your arms up, then stepping it in as you swing your arms down before repeating to the opposite side. Laura Williams is an exercise physiologist and fitness expert who swears by equipment-free exercises. Follow her on Twitter @girlsgonesporty.